Well, Lloyd’s parents and Sam’s parents are up in Nebraska for the funeral of Jim Sommerer, a distant relative that lived here in Seward. Everybody came over for dinner, and later in the evening Gracen said that he was hungry. I offered him boiled peanuts as a dare, and he accepted the challenge. He tried one right out of the can, and was immediately grossed out. 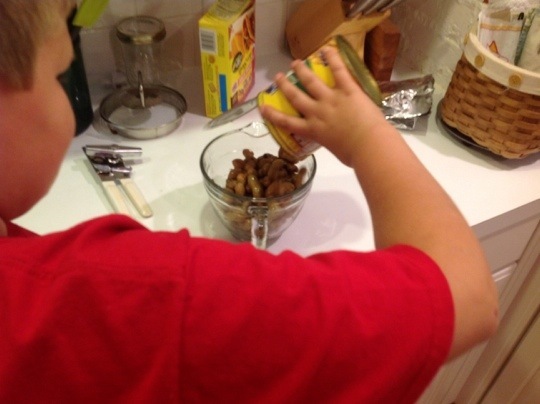 His grandma, however, said that boiled peanuts were a treat from her childhood and wanted to try them. It turns out that you need to serve them warm to be delicious, so I had to nuke them for a little bit. They were enjoyed by the adults as we heard of winter evenings spent snacking on warm boiled peanuts and big bowls of popcorn while playing cards. I’ll just have to trust that the peanuts were good, because it was well after 7 and I’m done eating then. 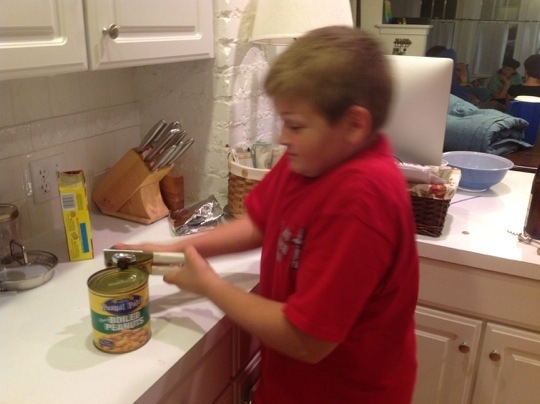 Gracen even changed his tune and proclaimed the warm peanuts salty and delicious. I guess I’ll have to keep the pantry stocked. I was there when you got those! I am imagining they tasted like edamame. Did anyone describe the flavor? Don’t know what the actual cause, but Gracen was up all night sick. No need to stock up on his account. Hmmm…..warm boiled peanuts. I wonder how they would compare to chestnuts roasting on an open fire. I’d stick with the roasted chestnuts, myself. 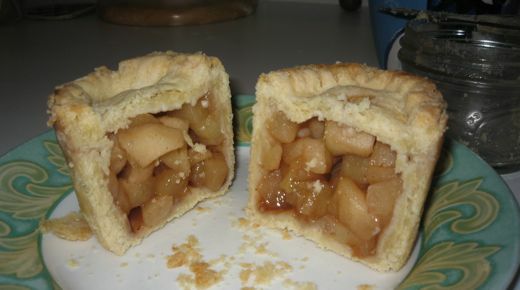 Hmmmm…..I am goina have to try these. Where did you find boiled peanuts? I think they were from WalMart -- the canned vegetable aisle, I believe.